Kiehls has been around since 1851 and just last year launched it's first store in South Africa. 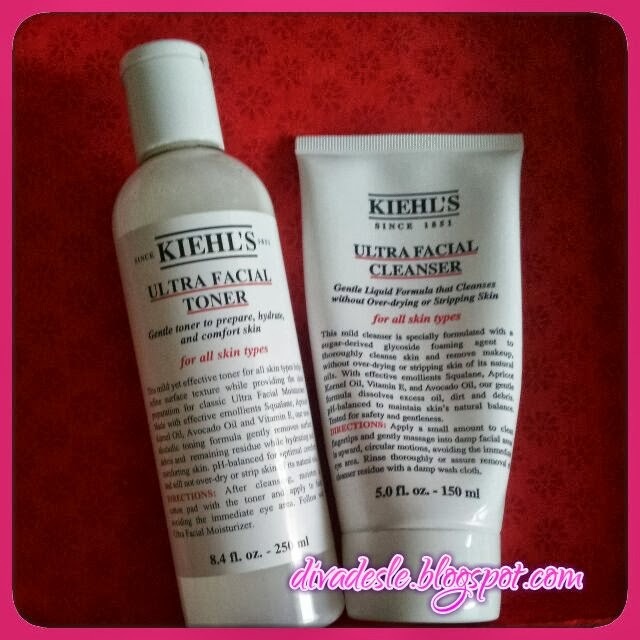 I was super excited to try the Kiehls range as I have heard many rave reviews about the brand. Thanks to my blogger bestie CityGirlVibe I got to try these wonderful Kiehls skincare products. Tasneem sent me full sized bottles of the Ultra Facial Cleanser and Toner. The facial cleanser is murky in colour and comes in a 150ml tube. It has no artificial fragrance or skin irritants. I use quite a substantial amount on my face as the cleanser does not lather easily when washing off makeup. This is one of the gentlest facial washes I have ever used as it does not irritate the eyes or the skin. It feels really soothing on the face when I rub it on. It contains avocado oil and vitamin E to gently cleanse the face leaving it soft and hydrated. The cleanser does struggle to remove heavy eye makeup and thick foundation so a precleanse would be necessary if you are wearing heavy makeup. I love the comforting clean feeling it leaves on my face. My skin feels smooth and not tight after using the product. I recommend this cleanser to those who have sensitive skin and want a soothing cleanser that does not strip the face of oils leaving it irritated or tight. The toner comes in a 150ml bottle and is milky in colour and creamy in texture. As the cleanser, the toner is surprisingly very gentle. I use it all over my face and especially my eyes to remove heavy eyeliner. It removes dirt and makeup easily without burning the eyes or the skin. I love the fact that it does not leave a sticky residue on the face as some toners do. This too is very comforting on the face and prepares the skin for the moisturiser. It can be used day or night for a thorough deep cleanse. I definitely recommend this for all skin types especially sensitive skin as this toner contains no alcohol that would burn the face. I really love Khiel's. I use the Midnight recovery concentrate on my skin every night. I've only tried their masks which are lovely. I may try their skin care line next year. I have sensitive skin. Excellent review Desle.